Thousands of years ago cats were worshiped as Gods. I have enjoyed having the past few days off and accomplished quite a bit. 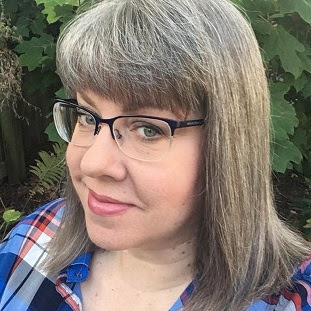 Got my hair cut, colored and highlighted, got the house whipped back into shape. Finally scrap-booked all of the pictures from our 2nd annual Gothic Halloween party... and just puttered. This morning I was awaken by my little calico cat named Brianna. We call her Brie for short, and she pounced on my head to make sure I was awake, as I had done something unheard of and had slept past 7:00am. Once she assured herself I was still among the living she snuggled into the quilts on the bed, on top of my legs, and ignored me. When I finally did get up she followed me around the house taking a fiendish delight in knocking things off the counter and yowling at me for reasons only she knows. 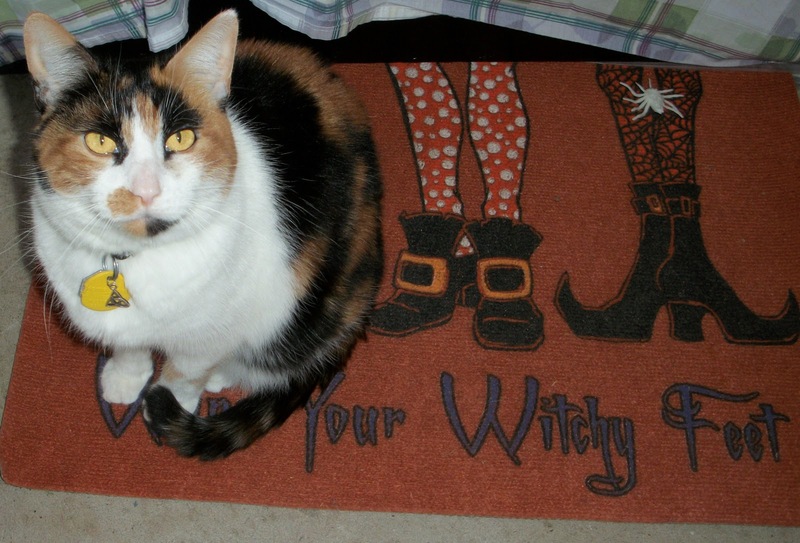 Here she is on the left- posing at the Halloween party on the witchy welcome mat. Yes, that is a triskel on her collar- tri-colored cat- triple knot symbol... It works for me. She's a tiny kitteh... only eight pounds and dainty- most of the time. When I staggered back to my office this morning, hot chocolate in hand, she lay sprawled across my keyboard and purring. As I sat there running through possible blog topics she kept staring at me with her gold eyes looking wise and mystical. So I asked her what she thought of a couple possible topics. Nothing got a reaction until I said "familiar" that got me a dainty meow and a head nudge to fulfill my duties as her human and to pet her. So... Witch's familiar blog coming up. A familiar is an animal, a pet that shares a psychic and magickal connection with a Witch. 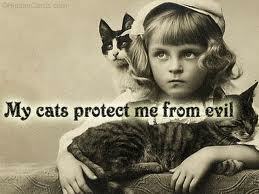 They are very protective and often clue in their human when magick is afoot or the energy is off. Cats are the classic familiar, but dogs, birds and ferrets also are popular familiars. 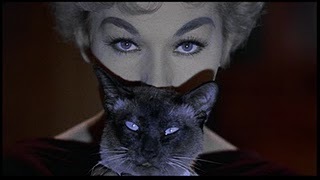 For this blog however, we are focusing on the feline familiar. But here is the trick. You do NOT choose your familiar- they in fact choose you. Yes indeed your beloved pet may be your familiar, or they may not. You will know the difference because a familiar can not keep their feline nose out of your magickal supplies, tarot cards, magickal books, the spell candles, or your work space. 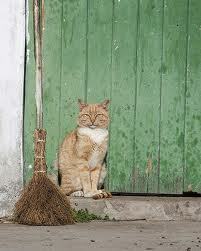 Your pet will let you know if they are interested in becoming your magickal working partner. So treat them with respect and affection, and do not force the issue. Familiars boost your energy by being close and working with you as a sort of magickal partner. In the simplest of terms they lend you a paw by boosting your energy. Now, your enchanted cat may be one of those feline guardians who takes their role as protector of the homestead very seriously. If they constantly position themselves by the doorways and seem intent on watching out the window for possible interlopers on their turf, you have a guardian cat energy going on there. This type of guardian cat partnership would be a added bonus for any type of protection or hearth and home magick you perform. Basic rule of thumb, just like a human working partner, you work with your cat in the same way, with respect, kindness, honor and love. 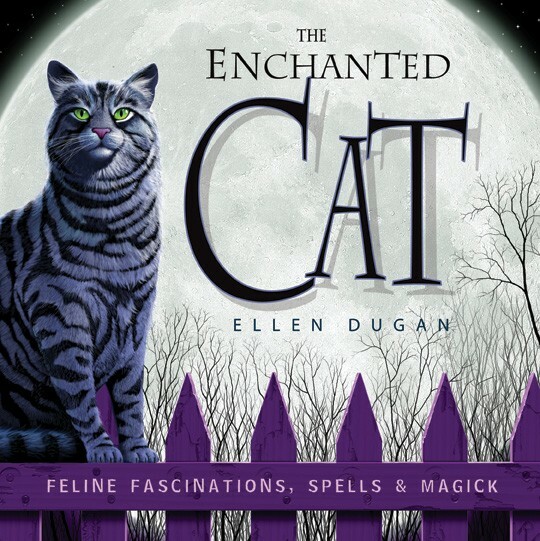 For more information on the feline familiar, cat deities, folklore, history, and cat-spells, please check out my award-winning book, The Enchanted Cat: Feline Fascinations, Spells & Magick. Oh and yes indeed it is available on Kindle. Great post !!!! I have three cats and love them to bits !!! My cat Mozart is most likely a familiar..! I love this We have 4 cats 2 males and 2 females , We love the all all black , the mommy kitty loves to sit beside of my husband when he does his circle and won't mover till its done. my other cat Sasha loves make up and will sit with me when I do mine. My cat has the exact same affinity for computers! It's the strangest thing but she loves to sprawl out on the laptop and sleep! I love her to bits though, she is the most amazing feline. Maybe you could create subsequent reports relating to this post. I would like to find out more problems approximately it! I have a solid black mancoon cat who will not leave me alone. He follows me meows at me waits at the door for me watches me sleep.. Is he my familiar?! My cat's eyes change color as well but so do mine? Im pretty sure in yhe old days this rectified the fact that a woman was a witch. I think it has something to do with channeling and the change of your energy and aura. Eyes are windows to the soul after all. Merry meet...I have just joined the household of a wonderful & naturally intuitive man and his adult daughter. He has an amazingly smart dog(m), and his daughter has a sweet & beautiful cat(f). Both animals have taken to me from the start & from the daughter's mouth, the cat doesn't really care for other female energies. This cat and dog both listen to me and show me great interest when ever, especially when I leave & I arrive home. They follow me around and seem interested in everything I do. The dog initiates a play-stance and runs around for me, which the daughter says never happens, only with her father, as well as the cat's initiating play and petting from me. My dilemma is that I have open approval from the father to ask his big white dog to be my familiar but the daughter is not open to me, only tolerant, of my new position in the household...she doesn't want anyone new in their lives. I'm sure it wouldn't be received well if I asked her to ask her cat for it's cooperation in my ritual Magic. What should I do? Both animals are very welcoming & receptive to me. Our relationship is relatively new & I'm not ready to ask to bring a new animal in when I see that both animals could fulfill the same sacred spot. The cat might be more of an option because she's smaller, IDK. Thank you for your feedback and blessed be. Okay so I have a very unique question about my familiar. He is a male cat. We've dreamt together, have a psychic connection and we adore each other. I have noticed he has this ability to be in 2 places at once and was wondering if anyone knows anything about this? I often see him, walk up to him only to realize he wasnt actually there to begin with. My mother and I even had a moment where we physically saw and heard him jump off of a dresser only to find he was never even in the room with us. Can anyone help me understand what this means? These "spell casters" are nothing more than scammers trolling for people dumb enough to believe all these "testimonies." It is quite obvious they are from a foreign country as you read their broken English and misspelled, misused words. The mistakes are consistent. Go find a real job, you idiot jerks! Thanks to Dr isong for giving me the opportunity to test from his Power. I was wondering why most successful people talk more about him even in my neighborhood on how he has been bringing back ex-lovers and making them achieve their lost opportunities and being successful. I doubted some enough until when I tried his power last month via his email. Dr. isong cast a reunion spell and brought back my ex lover after three months of our separation within 3days that he promised. Everything he did was like a movie in my eyes; it was so fast and effective. I felt a strong power in me when he was casting the spell which made me stronger in spirit to invite Scott spirit back in to me. I don’t have much to say, but to keep thanking him and telling people how I got the love of my life back. Please stop doubting and give him a try and see for yourself, open up your heart and focus on all the instructions from him and you will see results on your door post. Contact him today and see the miracle of his spell via drisongspellhome@gmail.com you can also talk with him on whatsapp +2347063612587.